Following on from the success of my most popular post – 11 tips for surviving summer pregnancy, it only seems natural to follow up with an ultimate guide for surviving pregnancy. As well as all the essential tips to plan and organise for a new baby. Pregnancy can be a bumpy ride, with no two pregnancies the same. Even the differences between subsequent pregnancies can be surprising, when you think you know what you’re in for but suddenly there are whole new symptoms and experiences to leave you pregnant, confused and uncomfortable. 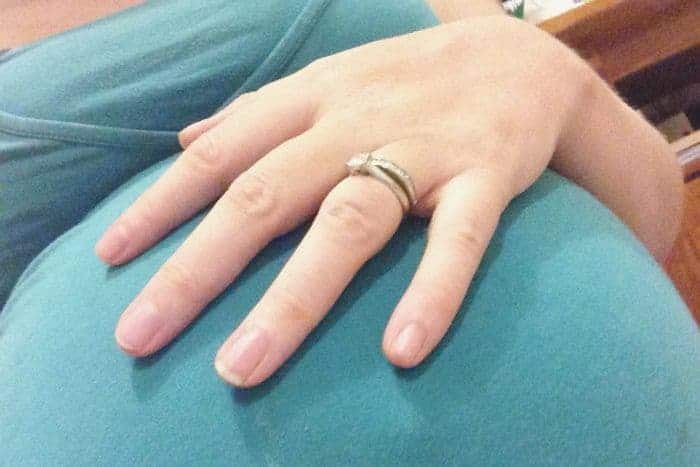 Having just finished my second pregnancy, I was surprised how different my pregnancies were. I was convinced I was having a boy the second time, but nope… both girls, so the difference in pregnancies couldn’t be attributed to gender. Just the luck of the draw! Not everyone is plagued by morning sickness, however some women are unlucky enough to have all day morning sickness. For most, it eases up around the end of the first trimester but for others, morning sickness lasts throughout pregnancy. Morning sickness is caused by the pregnancy hormone HCG. In really severe cases, morning sickness may be a condition known as Hyperemesis Gravidarum, which needs medical attention. For my first pregnancy, my morning sickness subsided around 16 weeks and was sporadic. With my second pregnancy, I was in a constant state of nausea, so my GP prescribed medication to manage my morning sickness nausea. It did the job! Heartburn and indigestion are common pregnancy symptoms, with heartburn causing a burning sensation in the throat and chest, and indigestion causing severe bloating and possible nausea. Teamed with morning sickness, they are an unpleasant and uncomfortable combination. Both are caused by the relaxing of muscles in the body during pregnancy, as the result of pregnancy hormones. Until my second pregnancy, I had no idea what indigestion or heartburn felt like, however my first trimester revealed how horrible this is. I had agonising bloating, stomach pains and a burning sensation in my throat that tasted like I had been licking an ashtray. It was revolting and extremely unpleasant. Antacid tablets were very helpful. This one is pretty self-explanatory in terms of unpleasantness, but constipation during pregnancy is common. Thank those hormonal changes again for this inconvenient and at times painful pregnancy ailment and post birth too, due to your body using up so much extra water. Carrying all that extra weight around while growing a small person can cause havoc on the body and back pain during pregnancy is common. The loosening ligaments and relaxed muscles also contribute to back pain and can sometimes require specialised intervention to support your back during pregnancy. Pregnancy can be a little like flying a long haul flight as fluid retention in pregnancy is common. Worse during summer pregnancy, you may be prone to swollen ankles especially, as a result of the increase in fluid in the body during pregnancy. Fluid retention can also be a sign of high blood pressure, so persistent fluid retention is worth getting checked out. Not sleeping during pregnancy is a frustrating experience. There are plenty of reasons it happens. None of them make us any happier. It’s pretty awful timing too since everyone warns you about the no sleep with a newborn stage that is coming, telling you to sleep while you still can. While some things may help you sleep during pregnancy, this can be one of the toughest ones to remedy. Restless legs was one of the worst things that plagued me during pregnancy. It’s horrendous because you feel like you need to keep moving, which makes sleep impossible. I found doing some leg stretches and a light walk before bed could help – which goes against the tips for improved sleep, however in my case restless legs was the main reason for not sleeping, rather than insomnia. Just one of common pregnancy problems. Another one that can’t be avoided and there isn’t much you can do about it, but you will definitely know the feeling of frequent urination during pregnancy, pretty much immediately. It’s often one of the first signs of pregnancy for many. There are certain times during pregnancy that are worse for frequent urination, especially near the start as a result of the HCG hormone, then again towards the end when there is a heavy baby sitting on your bladder. So fun… not! Pregnancy is an amazing time of life simply due to the reward at the end. Babies make all those awful symptoms totally worth it, but that’s not to say you shouldn’t do anything to help make your pregnancy more comfortable. What are your ultimate pregnancy survival tips? Rest! Getting rest is vital in pregnancy but not always easy to achieve with all the niggly symptoms and with other children to look after. I know when I got proper rest I felt like I could better manage each day so that’s my number 1 survival tip! So true! Everything is harder when exhausted. We are lucky to have another bub who is already sleeping at least 6 hours at night then back down for more sleep after a feed. Started a bit rough though lol sleep is a huge must! Oh god my heartburn was soooo bad at the end and I’d never experienced it before in my life. I was chewing rennies all the time just to be able to eat and sleep without feeling gross. I don’t know if there’s any truth to the old wives tale that heartburn equals a hairy baby, but I definitely had the heartburn + a hairy baby so maybe it is true. Oh wow, you took me right back there! I really do wonder what it’s going to be like my second time. I was extremely lucky to not suffer from morning sickness but towards the end of my pregnancy I did suffer from bad lower back pain to the point I had to wear a supportive brace. The reflux late in my pregnancy was absolutely horrible and having a summer baby, well my feet and legs looked like a bloody elephants!!! This is an awesome list Holly!! Sharing it with a few preggie friends now!